Technology associated with the written word doesn’t change often, but when it does it is certain to be disruptive. Disruptive innovation is usually preceded by a confluence of new technologies and social changes that provide the fertile soil for it to emerge and take hold. Gutenberg’s printing press with movable type is a perfect example of this. Two recent developments signal that the venerable book industry may be approaching a new tipping point of significant change. 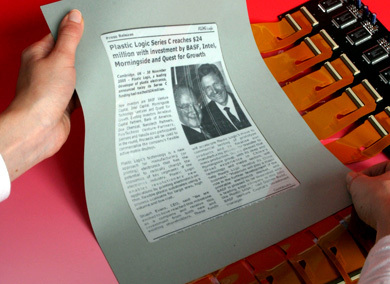 e-paper – This is technology in which display circuits are incorporated into a flexible substrate. Francois Ragnet of Xerox Global Services provides a nice overview of e-paper technology in his post “e-Paper – a suitable replacement for paper ?” on his blog The Future of Documents. Phillips and others have announced that they will launch displays based on “e-paper” in 2008. The displays are about as thin as a piece of paper and can be bent, rolled up and manipulated much like paper. The first applicaitons slated to use this technology are display screens in mobile devices, packaging and shelf labels. Phillips posted a video on YouTube of a mobile phone using the flexible displays (with a metal foil substrate). It may not be long before this technology finds its way into books, newspapers and magazines. Conductive ink – This technology allows simple display elements to be sprayed onto paper with a device simlar to an ink jet printer. The content on the page can then be linked to a computer and changed in response to user actions. 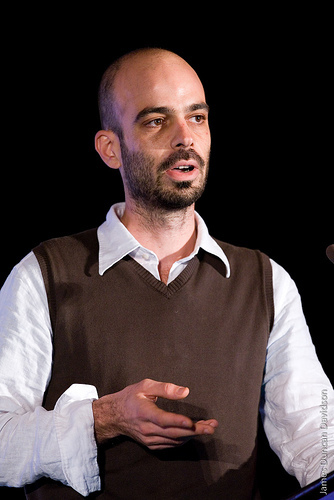 O’Reilly Radar recently reported on a talk by Manolis Kelaidis at the Tools of Change (TOC) conference on his work with a book utilizing this technology. The project name is blueBook and he has taken a patent out on the concept. At this point, he doesn’t have the funding to move forward on commercializing the idea, but he has received a lot of interest from large publishers. The real key will to the success of this approach is maintaining the well established characteristics of a paper book while providing easy to use e-book capabilities. We’ve speculated in an earlier post what a paper book with embedded computing might do that would make it irresistible to consumer. The possibilities are tantalizing if the computer in the book also has wireless networking capabilities. 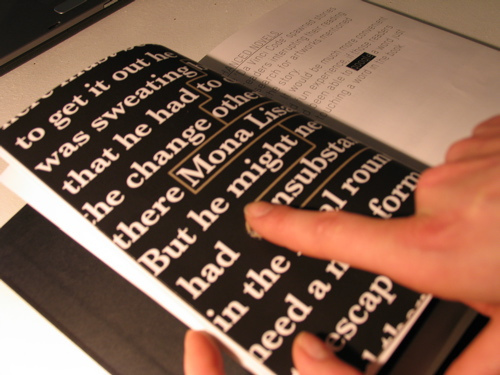 Paper books could expand into the realm of multimedia. Books as connected mobile devices would allow the reader to explore related online assets. Combined with a service like Google’s Book Search, every title could be a portable mini reference library. Publishers could help build communities for authors by providing a service that would let readers of a title connect with each other. Of course there would be a leraning curve. Older readers might prefer a book that’s only a book as we now know it. A younger generation of readers, however, might expect a book, like many other devices, to be connected and capable of delivering an interactive experience. Creating such experiences would certainly challenge publishers and authors. But it could lead future generations to re-embrace the book. This entry was posted in open publishing, publishing technology. Bookmark the permalink. I’m glad you enjoyed. e-papaer could make reading a whole new experience :-). One thing I really like about blogs is this: they spark a thought in my mind. The moment that happens, I feel like I need to write a comment with the hope it can be valuable to other people.understandinguseful I find myself coming back to to your writings simply because you have various awesome insights, that’s very exciting and tells me you know your stuff. what software do you prefer to write interactive book?